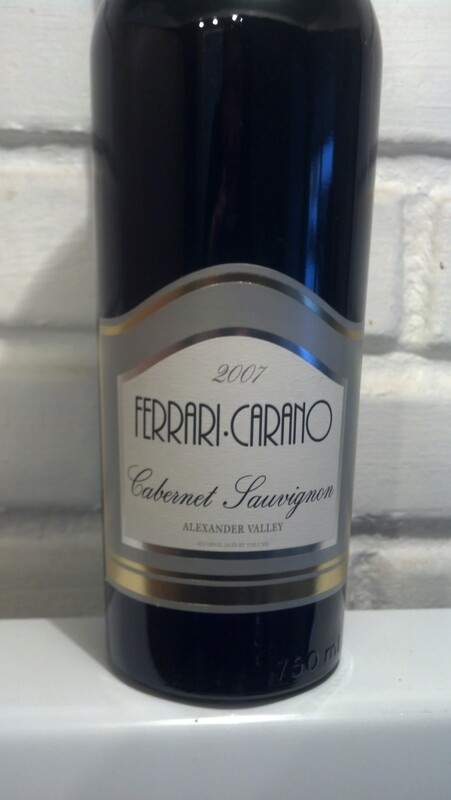 2007 Ferrari-Carano Cabernet Sauvignon | Wine Splash! I have been saving this beautiful wine for a couple years now and it still impresses me to no end. Garnet in color and very deep in hue. Wonderful smells of blackberry, cedar, and spice. Medium to full bodied over the palate. Silky with easy going tannins. Flavors of fresh ripe blackberry, wildberry, mocha, and even some clove. A nice elegant finish with hints of chocolate, earth, and more cedar. Excellent with beef, grilled red meats, pasta with tomato meat sauce, or maybe a portobello mushroom burger. This was a 2007 but I have heard 2010 and 2011 are also very good. We give the 2007 Ferrari-Carano Cabernet Sauvignon 90 points! If you have a 2007 vintage, I would drink it soon because the fruit is now at its max! WineSplashing!! I just had their 2011 a few weeks ago and was pretty impressed as well.